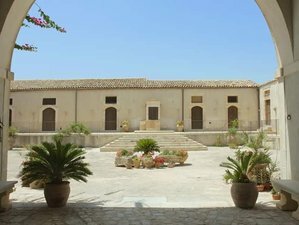 This is an eight-day retreat in the magical beauty of Mediterranean, ancient, and full of culture: Sicily, near little town Noto, in Syracuse, dedicated to your practice of yoga and meditation! Let's celebrate life and connect with your pure nature, wake up the energy of the body and the spirit that resides within, through the ancient science of yoga and active meditations, let's move to the rhythm within and explore and heal the depths and beauty of your own being! Here, you can allow yourself to relax in the welcoming atmosphere of the beautiful and recharging Danena retreat center created only for this and giving your senses a taste of beauty and relaxation. Danena Sicily is a holiday retreat that offers a revitalizing fusion of activities centered around yoga, nature, meditation, music, art, detoxification, and healthy food. Our main location is a 19th century farmhouse - La Masseria - situated in the luscious natural landscape of southeastern Sicily surrounded by the breathtaking Mediterranean sea. Excursion to Modica (not included), a city of UNESCO's historic heritage, a city of lush baroque buildings and just as luscious chocolate, and famous for the masterpieces of Sicilian cuisine that you can try there. You will begin your day with a teaching of the basic cleansing procedures in yoga kriyas, jala neti, cleaning your nose with salt water using a nety pot; extremely helpful in cases of sinusitis, and any kind of breathing problems. If the group is ready, you will continue with sutra nety, cleaning the nostrils with string and kynjal kriya or vamana dhouty. This class will start with a short meditation and continue with breathing exercises different by effect and practice pranayamas, gentle opening of the body, and escalate by their difficulty asanas-postures in traditional Indian teaching style, followed by meditation and yoga Nidra or deep relaxation. There will be intensive class of flowing asanas connected breathing and in-between Vinyasas. This will work your body flexibility, will make it strong, and will provide intense in-depth detoxification of tissues and muscles. You will learn bandhas, how to lead your energy higher, some mudras-position of the hand fingers and drishty, points of concentration of eyes during the asana performance. At the end of the practice, there will be meditation and a non-guided relaxation. Possible small changes in the program according group needs and possibilities. On the first part of our trip we will visit the beautiful city of Noto. Defined the “capital of Baroque”, in 2002, its historic center was declared a World Heritage Site by UNESCO, along with other late Baroque towns of Val di Noto. From Modica we will go to Ragusa Ibla, to visit the picturesque town built between two rivers, on the edge of a sort of canyon, a “Cava Iblea“. Do not miss the cathedral square of San Giorgio. Himalayan Ganga Yoga Shala offers Hatha, Ashtanga, Shivananda yoga, Kundalini, and Osho meditations, courses of Himalayan Reiki-Panic healing, and massages.